Daring Bakers July 2010: Ice Creams, Cakes and Bombes made in Heaven! I was super excited to do this challenge. I mean, it's ice cream!!! Who woudn't be excited?! :) Trust her to pick the season perfect challenge! 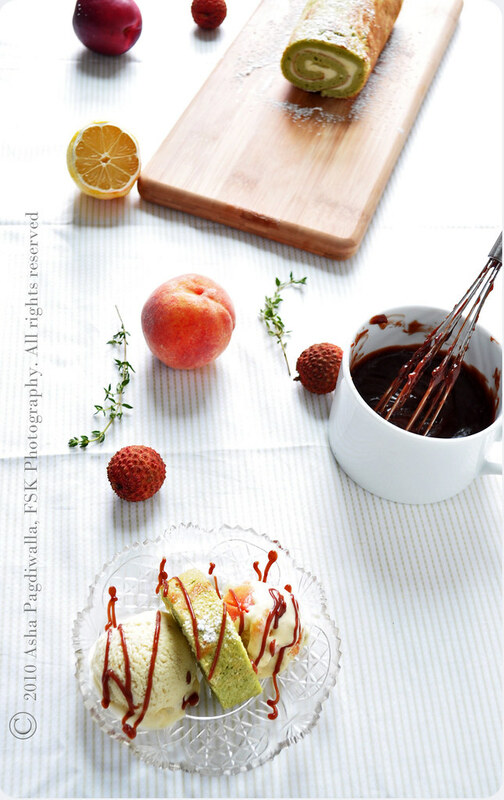 :) As temperatures soar across all seas and lands of the Northern Hemisphere, it's a solace to dig into a cool dessert and even better one made at home with the freshest ingredients like my Mango-Saffron Ice Cream. Plus, I had a bone to pick with Mr. FSK on the subject of homemade ice cream. This was the perfect opportunity! For the ice cream flavors, I had decided that it was going to be fruit. With all the gorgeous fresh fruit flooding the market in summer, there was no way I could turn away from them. 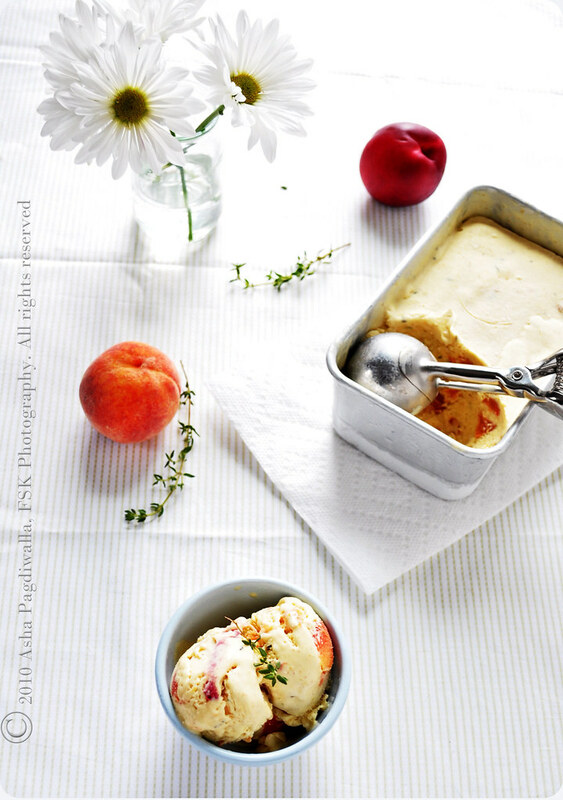 And, when I got a bag of beautiful organic peaches in my CSA basket, my mind was made up for one ice cream flavor. I also got a bunch of aromatic thyme from the farm and I just couldn't resist putting the two flavors together. The marriage was sublime. The lemony hint from the savory thyme complemented the sweetness of the peaches in beautiful balance! As to the second flavor, I went searching for inspiration to my favorite fruit vendor. That day, he had juicy ripe lychees for sale and offered me a taste. As soon, I bit into their milky white flesh, I was hooked! So, for my second flavor, I made a simple fresh lychee ice cream. Once I had decided all that, everything was just about ready to Go and I scrambled to pieces!! Literally. I went through two batches of curdled custard before I realised that using an electric blender while tempering the egg yolks was creating the issue. I fell back on the good old' hand whisking method and that worked like a charm! Phew! Only, I now had about 16 egg whites to work my way through! Where there is a will (or obstinancy, whichever way you want to look at it!) there will be creativity! I hadn't yet tackled the swiss roll/cake part. So, I decided that would be a pure egg white version. Googling led to surprisingly no practical results given that my dessert's design, even in its modified form, required rolling of the cake. The closest recipe I found was Jacques Pepin's chocolate roulade, which, really is a version of meringue. Hence, it ran the high risk of cracking while the cake was being rolled and I couldn't afford that. Traditional recipes for genoise use flour but also whole eggs or atleast yolks. I was adamant that I would use only whites to make my genoise. So, I created my own recipe by adapting the basic genoise recipe with some common baking sense. My experiment was wonderful success. The genoise, which I flavored with matcha powder, was very airy from the meringue I incorporated and had a light texture and feel in the mouth because there were no yolks. I think this is going to be my go-to sponge recipe. One note of caution though. Because, it's more meringue like than cake, the sponge does tend to get a bit sticky on top when left out as it absorbs more moisture from the air than a normal cake. 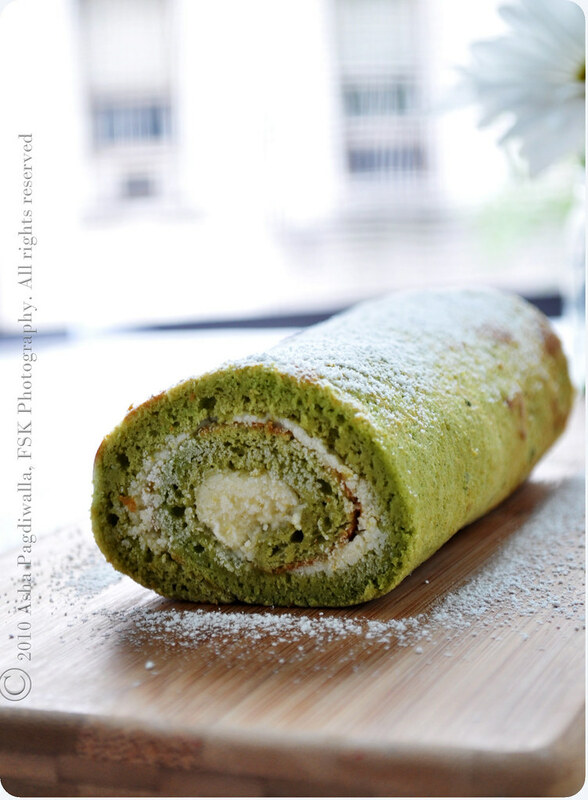 I also made the traditional swiss roll with the matcha sponge and a lemon mascarpone cream filling. 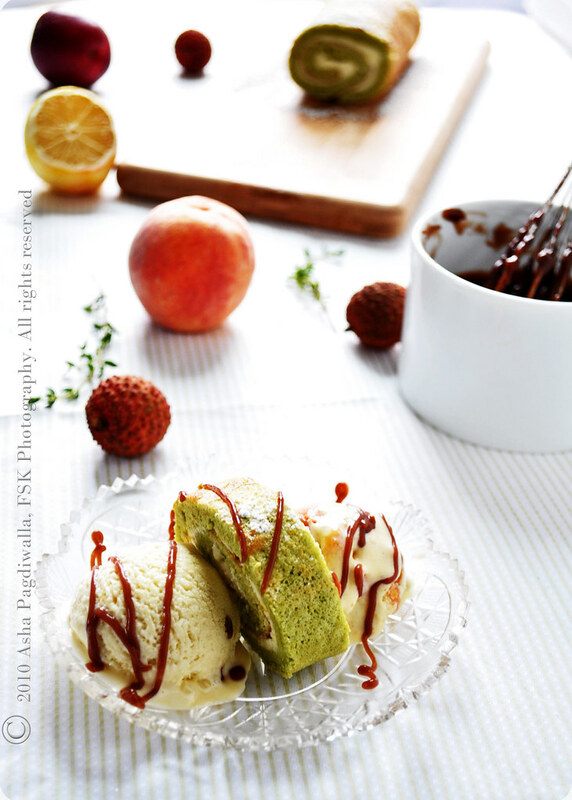 The lemon complements the green tea flavor nicely and served sandwiched between the two ice creams and drizzled with fudge, it makes for the perfect summer flavored dessert! Line a 11"x17" jelly roll pan with parchment paper. In a small sauce pan, melt the butter. Meanwhile sift together the salt, half the sugar, flour salt and matcha powder. When the butter is melted, add the flour mixture to the pan and incorporate into butter while cooking for two minutes. Add the milk and whisk quickly and briskly, to prevent lumps from forming, to a smooth flowing mixture. Remove from heat and set aside. Whip the egg whites to soft peaks and then slowly incorporate the remaining sugar to make a meringue that holds stiff peaks. Fold 1/4 of the meringue into the cooled flour mixture to loosen it. Add the lightened flour mixture to the remaining meringues and gently fold in until you see no more white streaks. Transfer the mixture to the jelly roll pan and spread evenly. Bake at 350F for 15 minutes until cooked through and lightly golden on top. Cool on tray until ready to assemble. Whip all the ingredients together until you get a smooth mixture. Do not over whip as the mascarpone can separate. Refrigerate until ready to use. 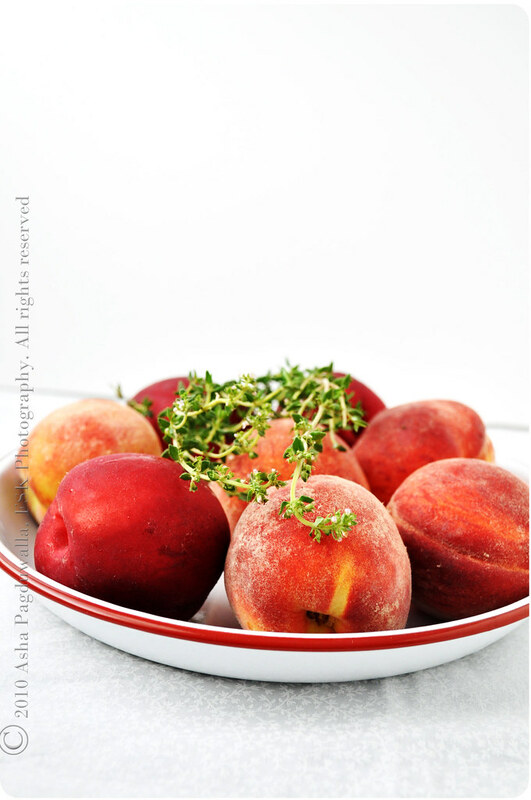 Arrange the peach slices in a oven proof dish and sprinkle the thyme leaves over them. Drizzle the honey over. Roast peaches at 350F for 30 minutes until soft. Let them cool and puree 2/3 of the roast peaches. Chop the rest into chunks and reserve. With a hand whisk, cream the yolks and sugar together until light yellow in color. Meanwhile, heat the half and half with the thyme stalks until just barely simmering. Remove the pan from heat and discard the thyme. Slowly, and while continuously whisking the mixture, incorporate the hot milk into the yolk mixture. Remove from heat immediately. Do not over heat as the eggs will curdle (done that before!). Whisk the mixture for a minute to stop the custard from cooking further. Strain through a fine sieve to remove any lumps or scrambles. Stir in the peach puree till fully incorporated. Cool the mixture to room temperature. Follow the same instructions as the previous ice cream for making the custard but skip the thyme infusion of the milk. Puree about 2/3 of lychees roughly to get lychee milk and tiny pieces of fruit. Chop the rest into chunks and reserve. Stir the pureed lychees into the custard and cool to room temperature. Return to the freezer and repeat the whisking every hour, three more times. By this time, volume of the ice cream would have doubled. If it hasn't, then you are not whisking enough each time. After the final repetition, gently fold in the reserved lychee chunks and freeze the mixture for atleast 6 hours or overnight. In a small saucepan, whisk together the sugar, cocoa powder, cornflour and water. Place the pan over heat, and stir constantly, till it begins to thicken and is smooth (for about 2 minutes). Remove from heat and mix in the butter and vanilla. Keep aside to cool. 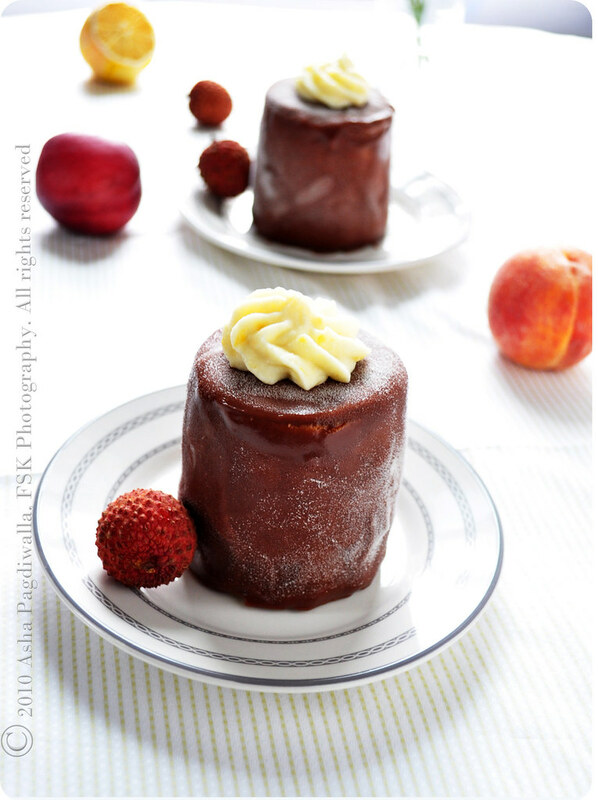 I used 2"x4" pastry molds for the individual bombes. Cut 2 inch rounds of the matcha cake. You'll need two discs per bombe. Place one cake disc at base of the pastry mold. Fill the mold to half with softened peach ice cream. Freeze for 10 minutes to set the ice cream. 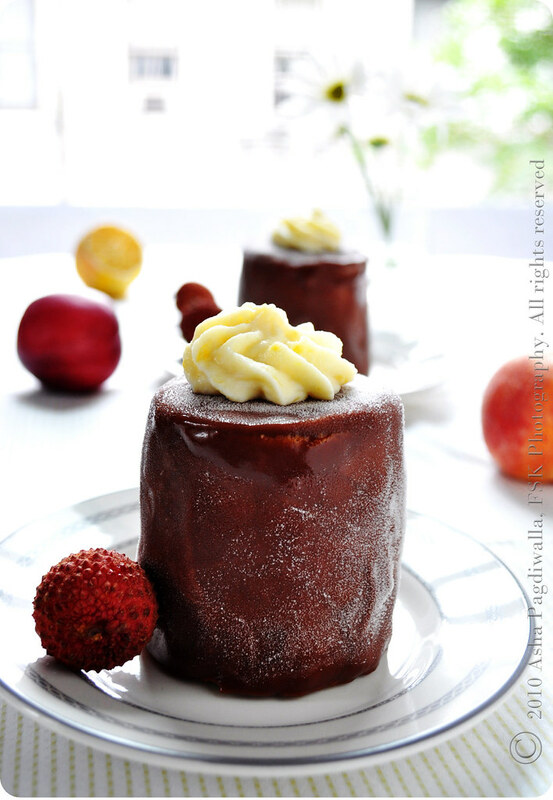 Top with another cake disc and then fill the rest of the mold with the lychee ice cream. Freeze for atleast 4 hours until the ice creams are set firmly. Gently ease out the mold from the cake. Cut rectangular sections of the sponge to fit around the ice cream cake. Wrap the cake sides with plastic wrap to ensure it maintain shape and sets. Freeze for another 2 hours. Once the fudge is completely cooled, pour over the assembled ice cream cake and spread evenly all over. Freeze overnight. Pipe the lemon mascarpone cream on top. Spread the cream mixture onto the genoise, making sure it does not go right to the edges (a border of ½ an inch should be fine). Starting from one of the shorter sides, start to make a roll with the towel going inside. Cool the wrapped roll on a rack, seam side down. Wrap the cake in parchment paper and refrigerate until ready to serve. Before serving, dust the top with powdered sugar. Slice the cake into one inch pieces and serve sandwiched between scoops of ice cream and drizzled with fudge sauce.